We love carrots. Their colour, their earthy taste, their juice, the fact we can grow them in a bucket in the back yard and if you have a sensitive tum we love them because they should not upset you. Carrots are low in FODMAPS and you can use them in salads, stews, as a side or in this vegetarian dish, as a main course. 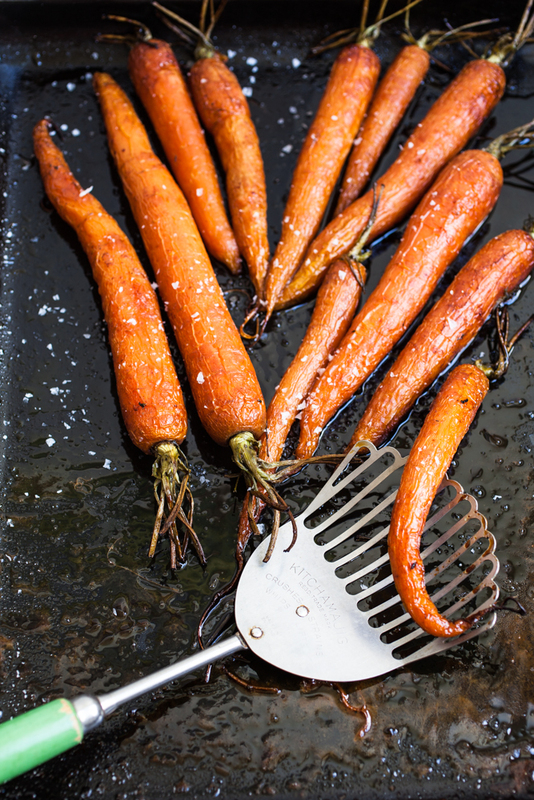 Roasting carrots with a little oil, salt and a dribble of maple syrup really brings out their flavour and makes them tender and slightly sweeter than if you had simply boiled them. But we love them with a mix of brown rice and quinoa as in the recipe below. How many can I eat? A medium carrot weighing 60g is low in FODMAPS. If you have other low FODMAP foods in your meal you can have another. Remember everyone’s threshold for eating a particular food is different so try a portion and see how you get on. The orange pigment in carrots is known as β-carotene. The human body converts β-carotene into vitamin A which is required for good vision, healthy skin and a functioning immune system. Vitamin A can be toxic if eaten in large quantities but you are alright with carrots. If the body has too much β-carotene it ceases to absorb it and thereby prevents conversion to vitamin A and subsequent toxicity. But if too many carrots are eaten (like 500g a day for a week) it leads to carotenodermia a harmless condition where the skin turns conspicuously orange. Carrots are a great food to include in the diet and we recommend a stock of them kept in the salad drawer of your fridge in sealed in a plastic bag. A few micro herbs or chopped parsley to serve. Preheat the oven to 200C/400F/gas 6. Scrub the carrots and trim the leaves leaving 2cm if stalk. Place the carrots in a roasting tin. Dribble maple syrup and olive oil over the carrots and sprinkle with flaked sea salt. Place in the oven to cook for 20 minutes to half an hour depending on their size. Meanwhile place the brown rice in a saucepan and cover with 300ml of water. Bring to the boil, reduce the heat and simmer the rice for 25 minutes or until tender. Drain and place in a bowl. Cook the quinoa for 10 minutes in plenty of boiling water and a little salt. Drain the quinoa and place in the bowl with the brown rice. Place the rocket and/or parsley in a food processor with the oil, lemon juice and salt. Liquidise to a thin liquid and add the feta. Taste and adjust the seasoning – add a little more lemon juice, salt or pepper to taste. Mix two tablespoons of pesto with the rice and quinoa and place the roasted carrots on top. Sprinkle with the some micro herbs or chopped parsley and serve. 04 Mar	This entry was written by Joan Ransley and published on March 4, 2015 at 9:05 pm. It’s filed under Dinner, Lunch, Snack and tagged brown rice, carrots, dietetics, feta cheese, gluten free, IBS, low FODMAP, LowFodMap, quinoa, roasted, roasted carrots. Bookmark the permalink. Follow any comments here with the RSS feed for this post.